The event was historic, really, Nebraska football fans showing up for a game that wasn’t played. Yes, there was the spring game in mid-April of 2012, thunder and lightning and rain and hail beforehand, and with the forecast for more, the cancellation and free concessions. But this was a real game, against a real opponent, Akron. According to the Cornhusker record book, before Saturday night, only three regular-season Nebraska games had ever been canceled, one on the road and none after fans had settled into their seats. The most recent cancellation had been a game against Pittsburgh on Nov. 13, 1943. It was cancelled because of World War II travel restrictions and not at the last minute. No one showed up at Memorial Stadium that afternoon. Prior to that, Nebraska’s game with Grinnell in 1898 was canceled, no reason given. The previous year a game against the KC Medics in Kansas City was canceled, again no reason given. The Grinnell game had been scheduled for Oct. 29, the game in Kansas City Nov. 19. Missouri forfeited a game that was to have been played in Omaha on Nov. 5, 1892, because Nebraska had a black player, George Flippin, and a year later, the Denver Athletic Club forfeited a Nov. 4 game after it had begun, with the score tied at 4. Flippin was also a part of that. The 2001 Rice game at Memorial Stadium was postponed from Sept. 15 to Thursday Sept. 20 because of 9/11 – later that season, a game at Baylor was suspended for 36 minutes because of lightning – but otherwise, games at Memorial Stadium have been played as scheduled. Nebraska was even among the relatively few schools that opted to play, Oklahoma, on the Saturday (Nov. 23) following the assassination of Pres. John F. Kennedy in 1963, with encouragement from the Orange Bowl committee, which needed the Big Eight’s automatic bid to be determined. For a time Saturday night, discussion in the Memorial Stadium pressbox focused on the last time a Husker home game had been suspended – Sept. 7, 1991. 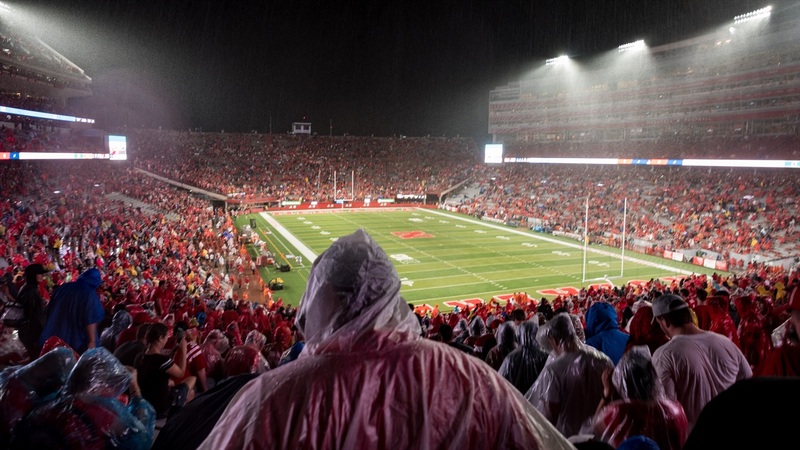 With 2:10 remaining in the third quarter, after a Calvin Jones touchdown (and missed extra point) had given Nebraska a 40-20 lead against Utah State, game officials stopped play because of lightning. Play resumed following a 19-minute delay that saw a reported “hundreds of students” in the crowd of 76,115 leave the stands and descend on the soaked field to pass the time. Play resumed at 3:43 p.m. with a Byron Bennett kickoff; the game had begun at 1 p.m. and the teams had played the first quarter in rain, even though the sun was shining. Senior Keithen McCant, who had seen no significant action during his career, replaced a struggling Mickey Joseph, also a senior, at quarterback in the second quarter and directed the Husker offense, which finished with an NCAA record 44 first downs and 787 yards of total offense in the 59-28 victory. McCant would remain the starter and earn recognition as the Big Eight Offensive Player of the Year, rushing for 654 yards and seven touchdowns and completing 97-of-168 passes for 1,454 yards and 13 touchdowns, with eight interceptions – the passing yards were the seventh-most in Husker history. McCant, Joseph and Todd Gragnano combined to throw 21 passes against Utah, “so we’re throwing the heck out of it,” Coach Tom Osborne said, tongue-in-cheek. In any case, the game was resumed. That didn’t happen on Saturday night. Fans saw the opening kickoff and that was it. Thanks for coming. Game canceled. History made.